We offer five fabulous fudge flavors for Thanksgiving Delivery - Pumpkin Pie, Chocolate, Chocolate Pecan, Double Dark Salted Caramel, and Maple Walnut! Place your order this week. Fudge orders placed for Thanksgiving Delivery will be shipped out on Friday November 17th! Instead of the same boring Pumpkin Pie, this year serve Joann's Pumpkin Pie Fudge. Everyone will love this new dessert. It has a wonderful pumpkin flavor like a pie, but with the smooth consistency of our creamy Joann's Fudge. For a fun dessert idea, you can put a piece of pumpkin fudge on a square of graham cracker and top with whipped cream. Once you try this, we guarantee you will want to make it an annual tradition. Let Joann's Fudge make your "Pumpkin Pie" this Thanksgiving! Every great fudge table has some chocolate fudge. Joann's Fudge has our three most popular chocolate fudge flavors available for Thanksgiving delivery. 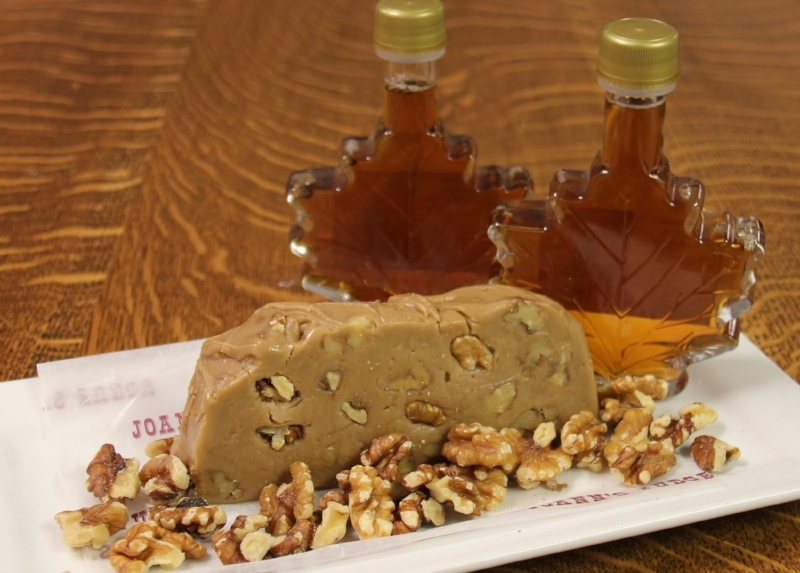 Maple Walnut is a fall favorite! Beautiful Mackinac Island in the fall season! We love making Joann's Fudge in the fall. The weather is crisp and the leaves are gorgeous. The towns slows down a bit, and so we have a chance to get out and enjoy our beautiful Island. We snuck out to take a few pictures last week that we think you will enjoy. Click on the images to view our fall carousel of photos! Click Here to Order Joann's Fudge for Thanksgiving Delivery!